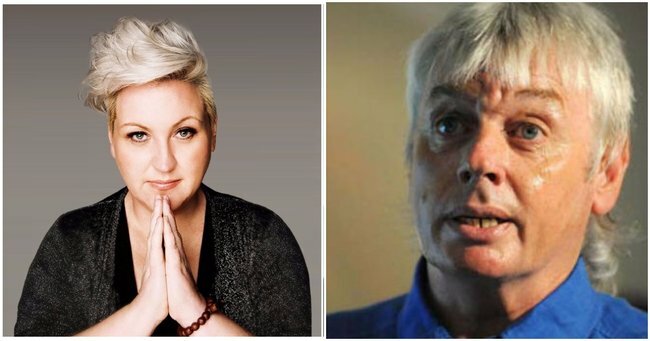 Meshel Laurie talks to conspiracy theorist David Icke. Some of his beliefs are... out there. You might not have heard of David Icke. He is a former British football player. Normal, right? A former BBC presenter, too. Yep, pretty normal too. And he believes the moon is a hollowed-out alien space station, Hillary Clinton, and the Queen are both reptile aliens sent to control the world, and 9/11 was a global conspiracy. Yep. David Icke is a conspiracy theorist. A full time investigator into “who, or what, is really controlling the world”. And people are genuinely, undeniably interested in what he has to say. Thousands of Australians lined up to see his shows when he recently toured Australia, many which sold out. We’ve been successfully enslaved by humanoid reptile aliens. Icke believes 60 per cent of the world’s leaders are shape-shifting humanoid reptiles, including Queen Elizabeth II, and they control the world. And the rest of us? We’re enslaved to them. “What they have done is incessantly centralised power in every area of our lives…it’s been given a name! Globalisation. Look at the world. Look at corporations. Look at the trade agreements and the power that they’re giving to corporations. Look at the centralisation of politics,” Icke says. “Are Clinton and Trump reptilian humanoids? Or are they just puppets and answering to the shadowy figures?” Meshel asks. “This is the thing with politics, you get the few, who are of this blood line, and then you get the many, who are just puppets. Clinton’s blood line, definitely. Trump – I have no idea,” Icke replies. America is behind 9/11 and responsible for ISIS. Icke’s theory about the September 11 attacks is that they were orchestrated by the American government as a justification for invading the Middle East. “What we’ve had since 9/11, and particularly since 2003 and the invasion of Iraq, is global journalistic schizophrenia…the people who are now accepted widely, to have lied to us about weapons of mass destruction in Iraq, to justify a war of slaughter of the innocent and all that’s come from it, are not only the same agencies, they are the same individuals that gave us the official story of 9/11,” Icke says. Vaccination is a fascist act. The full episode of The Nitty Gritty Committee isbelow. And like Meshel Laurie says, keep an open mind. And take a deep breath. It’s the podcast with stories of the guts and glory of life, and no one is perhaps gutsier than a man who says the things David Icke does.